Outdoor natural lighting comes in many forms, but the two most common problems that face photographers are harsh sunlight found on bright sunny days, or boring, low-contrast light found on cloudy or overcast days. Rarely do photographers find “perfect” lighting when working outdoors, and if they do, it doesn’t last long much less all day. So as photographers, we must “adjust” our lighting techniques to beat poor outdoor lighting in photography. One way to beat poor outdoor lighting in photography is with a SUNBOUNCE Sun-Cage as seen here on a bright sunny day. 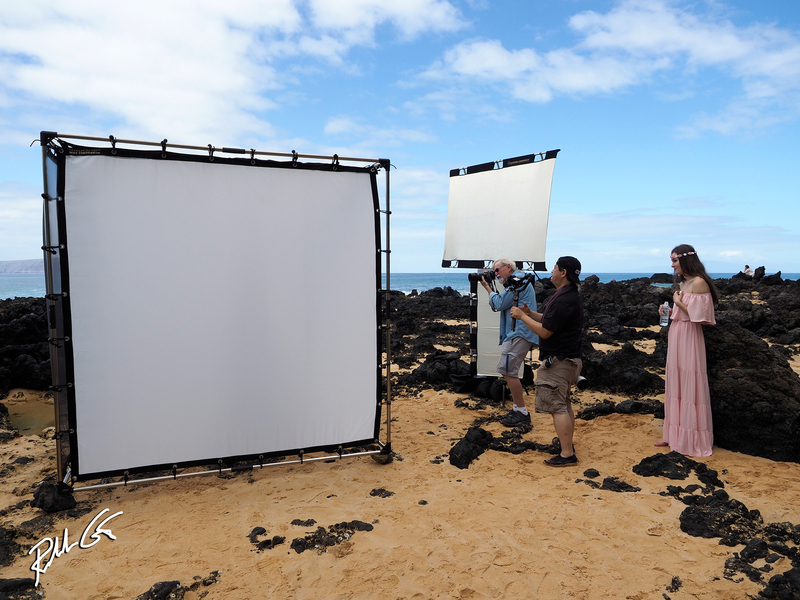 Notice the top and sides are -2/3 stop White fabric screens with a punch from the SUNBOUNCE PRO and MINI reflectors. Notice the background we used a -1/3 stop No Moiré black fabric screen to darken the background but not the model. While it’s not uncommon to hear photographers say you can shoot all day on a cloudy or overcast day, but personally I don’t know any professional photographer that waits for only cloudy days to capture photos. One reason, they’d always be working with low-contrast boring light! It’s blah. Yes, it’s a flat, even light with practically no shadows or very soft shadows, that can flatter people’s skin, especially those with complexion issues, but it produces a lifeless, dull, one-dimensional photo. Some photographers will use fill-flash, and while it works artificially, it’s still fill-flash and looks like a “flash” photo, not a natural photo — basically you’ve wiped out the natural out of Mother Nature’s light. This is one of the photos using the above Sun-Cage with three -2/3 stop White screens and the SUNBOUNCE MINI and PRO reflectors. No flash needed. But there are natural light solutions to beat poor outdoor lighting in photography found on a cloudy or overcast day. The best solution is the SUNBOUNCE Sun-Cage because it allows you to interchange the fabric side panels on all sides, but the easiest way to add life to your photos is to take one or both of the sides and use the black fabric screen. Black will naturally put contrast and tones back into your photos. The easiest way to understand this photography technique to beat poor outdoor lighting in photography is to understand contrast. Simply put, contrast and its strength rely on the range of your darkest shadow and your brightest highlight, specifically the range between highlights and shadows, not just the range between black and white. The bigger the range, the higher the contrast, the smaller the range, the lower the contrast. As I explained in my previous photography tip, Outdoor Model Photography you can accomplish this with the Sun-Cage and at least one black panel fabric screen on one side of your subject. By adding black tones from the screen approximately 90-percent of the light is subtracted from your subject on that one side, thus increasing your tonal range and contrast. While the white screen of a Sun-Cage reduces light by a -2/3 stop, that’s light entering from the other side, the white material still reflects approximately 90-percent of the light found in the cage. Think of a minus 90-percent of light on the black side and an increase of 90-percent of light on the white side, white vs. black, equals increased contrast. It’s s simple property of light physics. But perhaps you’re a wedding photographer, not a model photographer, simple, use a black on both sides if you’re shooting the bridal photo of the bride in a white wedding gown and if it’s a photo of the bride and groom side-by-side, and your groom sports the traditional black tuxedo and the bride her white wedding gown, you’d have a black screen on the bride’s side of the frame and a white screen on the groom’s side of the frame. If the model were wearing a white wedding dress, we’d change the left -2/3 stop white screen with a black fabric screen with this set-up. You’d use this same technique in the studio with white and black V-flats or a SUNBOUNCE PRO with a black reflector screen on the bride’s side and a SUNBOUNCE PRO with a white reflector screen on the groom’s side. If it’s a portrait and not full-length, then the SUNBOUNCE MINI with the same fabric screens will do just fine. So, before we go to harsh light when it comes on how to beat poor outdoor lighting in photography, let’s review cloudy light conditions — the light is flat, even and boring and you can fix it by simply adding black into the mix. It’s that easy and you can do it with a black panel on the Sun-Cage or even just by introducing a SUNBOUNCE PRO or MINI photography reflector fitted with a black reflector screen. Problem solved. Here you can see the result from the Sun-Cage with the top and left side a -2/3 stop white fabric screen the right black fabric screen plus the SUNBOUNCE PRO and MINI reflectors acting as a main light and kicker light. Now let’s look how to beat poor outdoor lighting in photography when it comes to a bright sunny day and the harsh light it naturally produces. Once again, you can use fill-flash and “overpower the sun” with flash but you’d better have a powerful flash if your camera doesn’t high shutter-speed sync with flash. In the end, you still have another “flash” photo of artificial light instead of the beauty found in natural light and chances are your photos will require more postproduction to remove the blemishes as flash is notorious for making them stand out like pimples. But now we’ll pretend for a minute you’d rather save your desktop time for something less tedious and you want to get it right in the camera and not rely on image manipulating software as your crutch. Again, the simple solution is the Sun-Cage, but this time, for the top, and two sides use the SUNBOUNCE -2/3 stop White fabric screens. STOP! But Rolando, aren’t we back to light similar to a cloudy or overcast day? Not really, as while the light quality looks even, you grab a SUNBOUNCE PRO or MINI, or both, and BAM, you’ve got a slight “punch” of contrast of high-quality reflected natural light, not flash. Just make one reflector your main light and the other a fill or kicker light, it’s that simple. One thing to note, the reflector fabric screen determines the contrast and quality of the light. Personally my “go-to” SUNBOUNCE photography reflector screen is the Sparkling Sun as it’s not gold and it’s not silver, it’s basically balanced to subtract approximately 650 Kelvin on one side and at 400 Kelvin on the other side when it comes to mid-afternoon daylight. This provides a little more warmth than plain colorless sunlight. The perfect warmth and the perfect light quality for humans! My other favorite is the SUNBOUNCE Zebra fabric, a mixture of gold and silver, or for darker skin subjects, the SUNBOUNCE 3D Silver Raindrops as the raindrops deflect the silver light rays in a more flattering pattern than just plain smooth silver. Wait! You’re probably thinking, “A little out of my budget range Rolando.” Well let’s look at that for a moment and put everything in perspective. When you own or rent an indoor, permanent structure building for a photography studio, besides the recurring bills and upkeep, think what that does to your budget. Personally, I gave up owning a studio over two decades ago as I found myself outdoors more than indoors and I prefer to have a “pay for it only once” mobile and portable studio that I can take to any suitable location and assemble in about fifteen minutes and tear it down even faster. 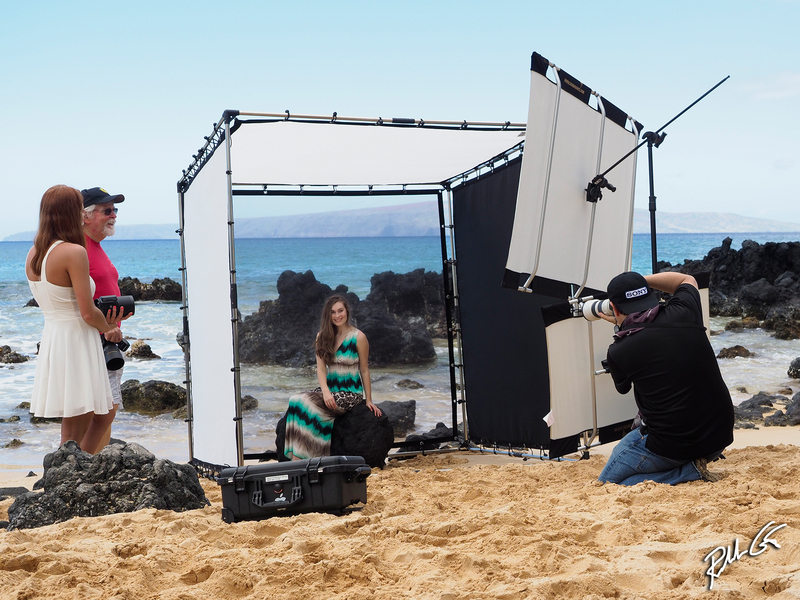 Here you can see the Sun-Cage and the SUNBOUNCE PRO and MINI in action for professional photographer Michael Majewski. The Sun-Cage will beat any indoor studio when you look at fixed and tangible costs and the coolest thing, I can take the Sun-Cage to any natural background in the world or manmade background for that matter. Mother Nature, whether it provides me the natural light source without the electric bill or scenic backgrounds is a lot less expensive than a permanent photography studio. Besides, isn’t the idea that a photographer should make any location their studio? Indoors or outdoors? Of course it is. If you can afford a digital camera, you can afford the right lighting gear to get the best out of your cameras and lenses. Your clients or subjects will love you for it. Ultimately your photos are a direct reflection of your photography quality and your photographic abilities. Simply put, you can’t beat Mother Nature, nothing can, but with the right photography lighting tools you can control the light to your advantage and make your photographs stand out especially if you want to beat poor outdoor lighting in photography. In a nutshell, make your photos and photography stand out instead of standing still. Save the flash for the bottom edge of a sunset or when the lights go out, or if you prefer, for studio cabin fever instead of the great outdoors.